My November Birchbox is amazing! This is by far my favorite Birchbox since I started receiving my subscription boxes over the summer. Since we are in the month of Thanksgiving the theme for this box is Give, such a great idea. Read below to see everything I received and if you want to order your own subscription to Birchbox (or even give it to someone), click here to sign up. 1.) ModelCo Fibre LASHXTEND Lengthening Mascara: This mascara made the box completely worthwhile. I love when Birchbox sends full size products! Plus, this mascara lives up to its name as my lashes look longer when I wear this product. I think I just found my new mascara for my regular eye makeup routine. Since this product is so amazing, its deserves its own photo. 2.) One Love Organics Aromatic Body Serum: I’ve never used a Body Serum before, so this is an interesting product to me. This is a spray on oil that keeps your skin hydrated. It certainly works in the hydration department, but I’m not 100% sold on the scent yet. I will probably just use this product at night. 3.) John Varvatos Artisan fragrance: A fragrance to give to a man! Tolar may be rocking this new scent soon; I like it because it isn’t too overpowering and has a very clean, warm woods smell. 4.) Mox Botanicals Pomegranate and Fig Lip Butter: This cute little container will be added to my beauty bag in my purse. The lip butter is designed to revive lips with avocado oil and shea butter. It goes on very smoothly and has a fantastic scent! 5.) Reusable gift envelope: Birchbox probably doesn’t count this as one of their monthly products, but I do. I’m often searching for cute little boxes to wrap small items in and this box will do the trick. 6.) Lulu Organics Hair Powder: Dry Shampoo is one of my favorite hair products to use, so I’m intrigued and excited to try a hair powder. This product is supposed to provide plenty of lift, but no residue. Can’t wait to try it out! 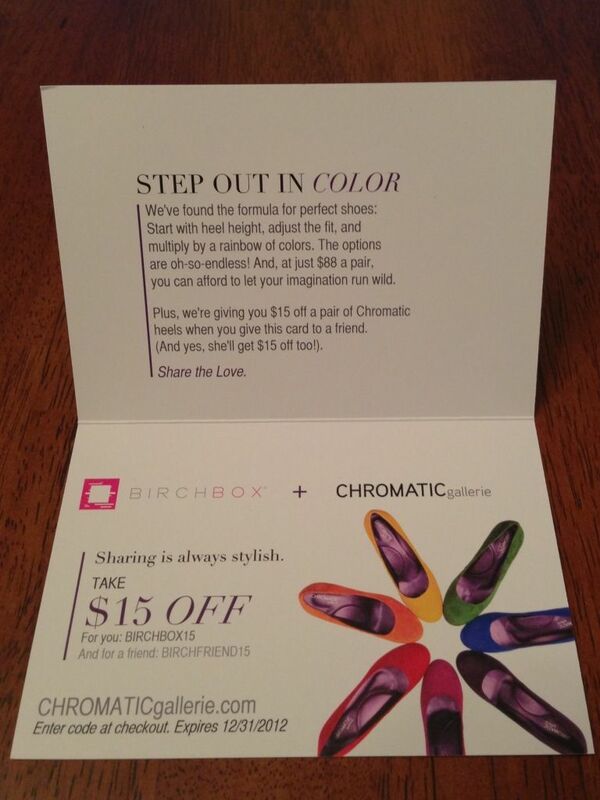 Birchbox Extra: Continuing with the give theme, Birchbox included a coupon to Chromatic Gallerie for me to pass along to a friend. We both get $15 off a pair of Chromatic heels. Love that! 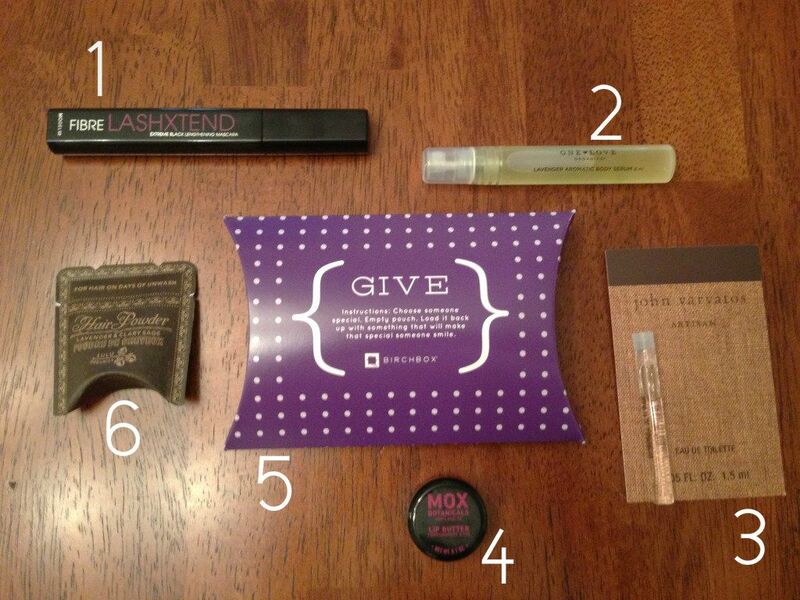 What did you get in your Birchbox for November? Leave a comment and let me know. And again, if you want to sign up for a subscription, click here. It won't be long now, I think I only waited a couple weeks before I got invited to join. I love your blog, and I am an avid follower! I nominated you for the Liebster Award. Please follow this link to my blog to fulfil the rest of the nomination requirments. Happy Holidays! Thanks Chelsee, Abbey above also nominated me. I'm definitely feeling the love. It's fun that people's boxes are different. I'm totally jealous of your full size mascara! I got that Mox lip butter in my October box and it's definitely one of my favorites! I'm not a fan of the smell of the body serum's scent either. I got a bunch of creams and gels I need to remember to try out so they don't just sit in a drawer! Oh I'm jealous! I missed out on this months box. Hopefully I can start posting about my own next month, along with Bluum, and maybe Glossybox too! Get on it girl - the box is amazing. I bought Bluum for my sister when she was pregnant. I got a ModelCo lipstick/gloss in a recent Glossybox and loved it! 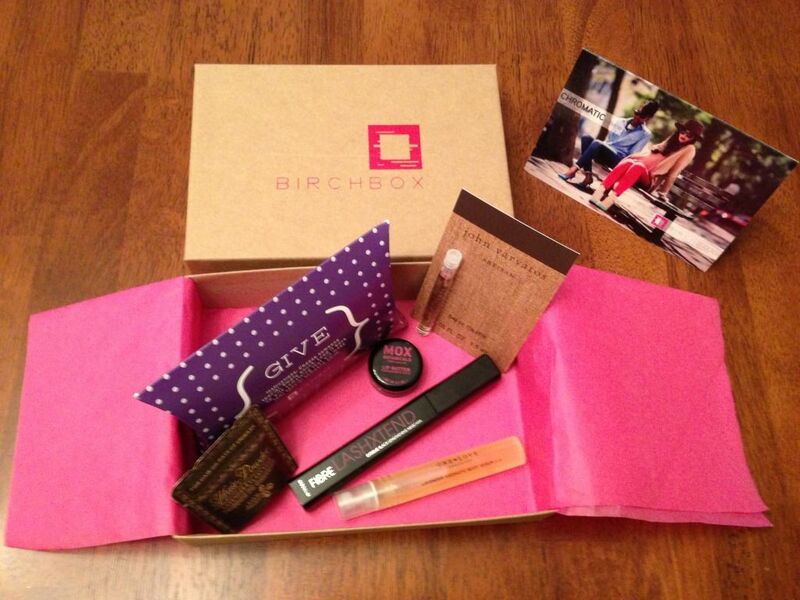 I hope I get the mascara in my Birchbox this month! I hope you do too. It's kind of amazing. Whoa! That sounds like an amazing box!! !